Shell Lubricants is giving value back to its customers in Jamaica with free phone card credit to help them stay in touch. Robert Jackson, General Manager of Sol Petroleum Jamaica Ltd (Sol Jamaica), the Shell Lubricants Macro Distributor, said customers of Shell Lubricants were among many Jamaicans who valued the opportunity to stay connected with business associates, family and friends. He said this was the rationale behind the new Shell Lubricants phone card promotion, which for the next two months, will offer free phone cards to customers purchasing either one gallon or four quarts of Shell Helix or Shell Rimula lubricants. Jackson said Sol Jamaica was passionate about offering high quality lubricants to the Jamaican market, and encouraged customers to keep using Shell Helix and Rimula products, which offer vehicle owners a choice for extending the life of their engines, and the highest level of protection available in the market, with options for both new and high-mileage vehicles. 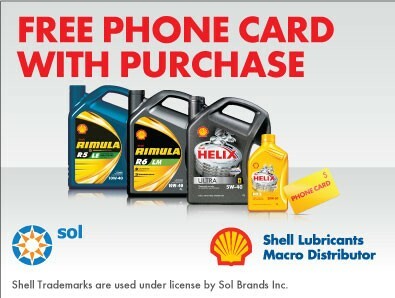 During the promotion, which runs from August 26th to October 24th, customers purchasing Shell Helix or Shell Rimula in the required quantities will automatically receive free phone card credit valued at JMD.$300 on synthetics, semi-synthetic and high mileage (premium) products, and JMD.$200 on mineral products. The offer is available at resellers and auto-part shops across Jamaica and Smith expressed thanks to these participating locations for their partnership in executing the promotion.